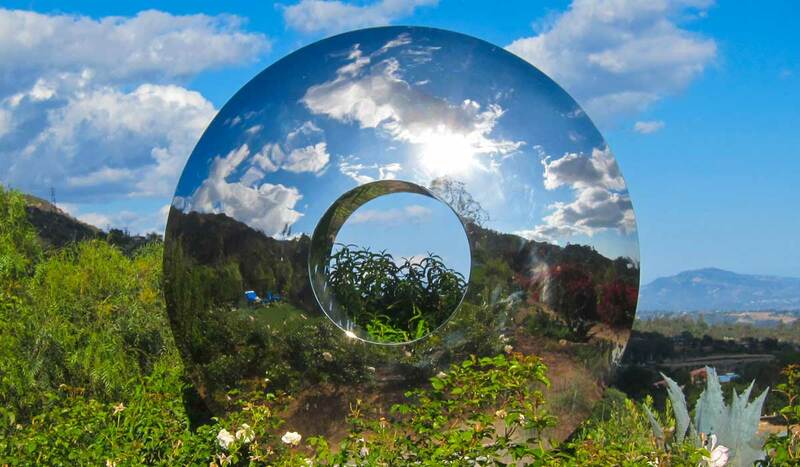 The now famous water feature – Aqualens – was designed by Allison in 1999, as the centrepiece of a show garden at the 2000 Chelsea Flower Show, where she won a silver medal on her debut for “Garden of Reflections”. It makes a fantastic addition to any garden, big or small, urban or rural and works throughout the year, including freezing conditions. Part water feature, part artwork; please scroll through some of the photos shown here. 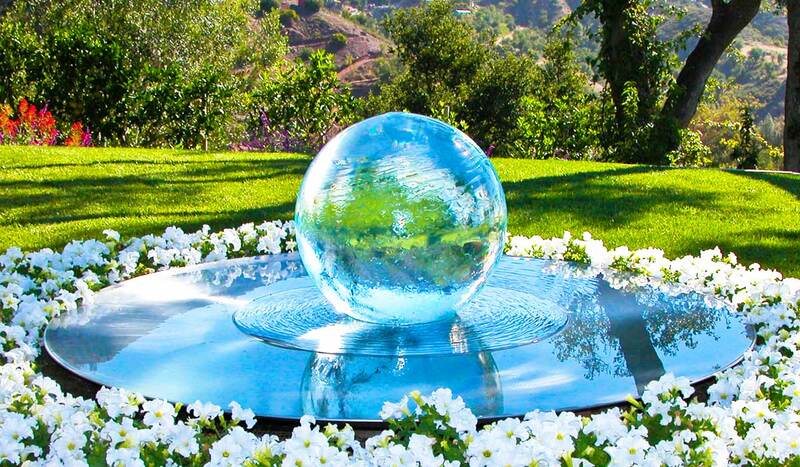 This fountain is a 2 foot (60cm) sphere, filled and overflowing with water from a concealed pump. Aqualens sets this on a circular stainless steel platform, which in turn is set in a 1.5metre (5 feet) diameter stainless steel dish. The dish can be dug into a lawn, or set on a terrace or other firm level surface (the pool has a fitted collar so it sits level). The 2 standard sizes are 5 (1.5) and 6 foot (2 meter) but I can make any size dish and sphere and customize it in a variety of ways. It can also be made to overflow into another pool. 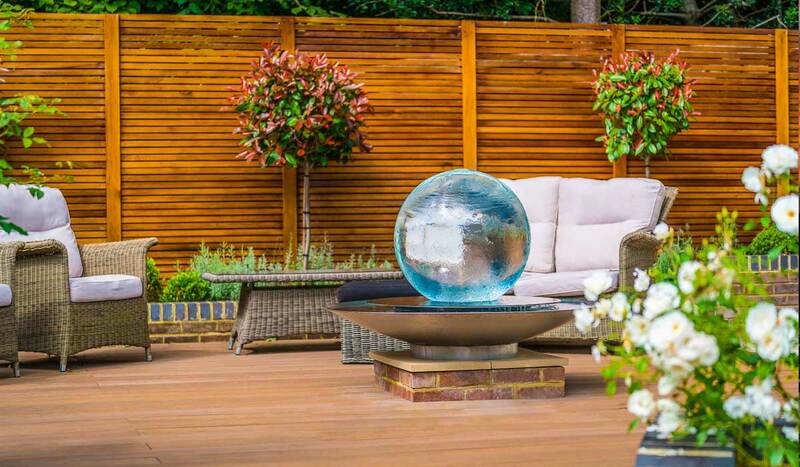 The Aqualens water feature is easy to install and maintain. It come fully assembled, complete with everything you need. Just unwrap, place on a solid level surface, fill with a hose and plug in. The water recirculates. All you need is an electrical socket nearby. The Aqualens is made of marine grade polished stainless steel. 316 grade. 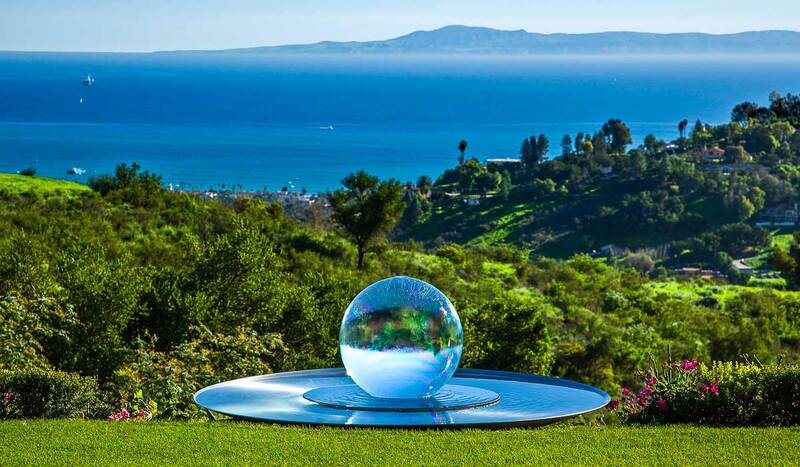 The sphere is acrylic and completely UV protected. It will not deteriorate in the sun. Use small chlorine tablets to prevent algae. It comes in 3 standard sizes however Allison can make any size you like with spheres up to 5 foot or 1.5 meters in diameter and stainless steel dishes up to 8-feet (2.2meters). 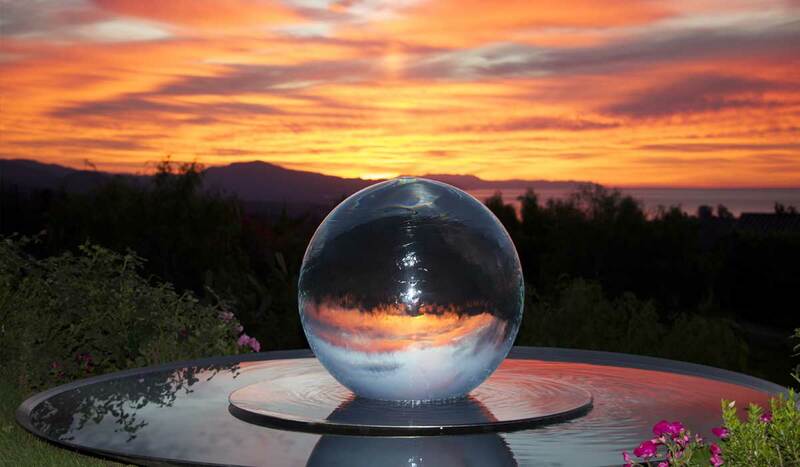 Aqualens Sphere Water Fountains are made both in the USA and UK. Click here to view the installation and maintenance document. Fountains come fully assembled and complete with everything you need.